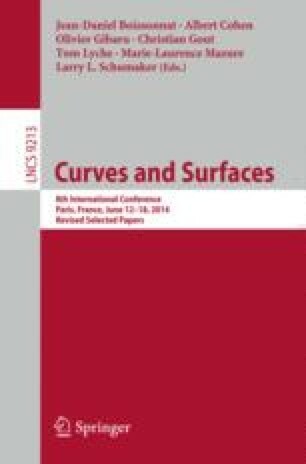 This paper presents a new end condition scheme for lofting through singular points, one that is easily specified and can generate shapes that are appropriate for lofting to the noses of subsonic/transonic aerodynamic and some hydrodynamic crafts. A degeneracy in the tensor product parameterization is typical in representations of spheres and ellipsoids, or topological equivalents. In that case a grid of data typically sets a whole row to a single value, so it becomes difficult and cumbersome to specify shape characteristics in different directions emanating from that point. Some standardly used end conditions result in shapes that are \(C^0\) at the singular point, an undesirable outcome in nose regions of subsonic aircraft, so the straightforward nose-to-tail lofts are intractable for these vehicles. The proposed method overcomes this problem (See Figs. 1 and 2 for examples). This work is supported in part by NSF IIS-1117997 and in part through NASA Cooperative Agreement NNX11AI66A – Christopher Heath (NASA Glenn Research Center) is the Technical Monitor.